In order to be awarded the Robert A. McNeece Top Pro Prospect Award, a player must demonstrate poise, mental toughness and sheer athletic ability. 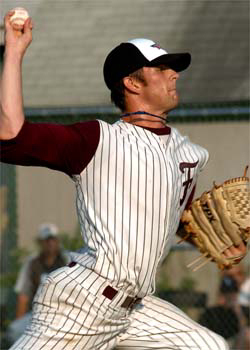 During the 2007 Cape Cod Baseball League season, Falmouth pitcher Aaron Crow displayed all three qualities each time he stepped on the mound. The 6-2, 201-pound right-hander from Wakarusa, Kan., was a dominating force for the Commodores during their march to the Cape League finals. He compiled a 3-1 won-lost record and a league-best 0.67 ERA. In 40-1/3 innings of pitching, he gave up just 19 hits and seven runs, only three of them earned, while walking nine batters, hitting four and striking out 36. While all of Crow’s statistics are impressive, his low walk total and his strikeouts-to-walks ratio are the figures that have caught the eye of big league scouts, many of whom watched him overpower the opposition as the West Division starter in July’s CCBL All-Star Game at Wareham. He struck out the side in the one inning he was allowed to pitch and was named the West’s Under Armour Undeniable Player of the Game for his effort. The University of Missouri junior was used as both a starter and a reliever in his freshman year, but was strictly a starter this past season as a sophomore. He was 1-4 with a 4.06 ERA as a freshman, but turned in his best performance that season at the NCAA Malibu Regional in his final start when he pitched a one-run, six-hit complete game win over Pepperdine to keep the Tigers alive. He continued that brilliance in his sophomore year, compiling a 9-4 record and a 3.59 ERA. In 18 appearances, all starts, he pitched two complete games, worked a total of 117-2/3 innings had an impressive strikeouts-to-walks ratio of 90-33. He gave up 109 hits and 57 runs, 47 of them earned. The Tigers are expecting big things from Crow in the 2007-2008 season. Falmouth General Manager Dan Dunn compares Crow’s mound presence to that of Cincinnati Reds hurler Eric Milton, who pitched for the Commodores in 1995 and 1996. Dunn also likened Crow to future Hall of Famer Pedro Martinez of the New York Mets. “Although his delivery and pitch selection may differ, he has many qualities of a younger Pedro,” the GM enthused. “He gets ahead and uses his multi pitches and fastball to blow guys away.” That fastball often reached speeds of 97 and 98 mph this summer, Dunn said. Dunn sees Crow as a “can’t miss” big league prospect. “He has several pitches, he has great confidence and he commands the mound well. His ability to get ahead of hitters more often than not allows him to touch the edges of the plate and get batters out much earlier,” Dunn said, adding that Crow’s size and physical conditioning are other factors that will likely land him a high position in next spring’s first-year player draft. Not to put pressure on Crow, but past McNeese Award winners have historically been chosen high in the draft and many have gone on to achieve notable success in the major leagues. Last year’s selection, Matt Wieters (Orleans), a switch-hitting catcher out of Georgia Tech, signed a lucrative contract with the Baltimore Orioles, who had made him their No. 1 draft pick and fifth choice overall. Wieters reportedly received a $6 million signing bonus from the O’s and seems a sure bet to advance quickly to the majors. 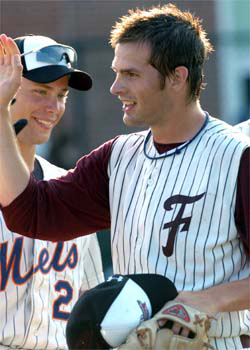 The 2005 winner, left-handed pitcher Andrew Miller (Chatham), is already in the big leagues as a member of the starting rotation for the defending American League champion Detroit Tigers. Crow need only glance at the list of past McNeece Award winners to see what may lie ahead for him. He joins the likes of Russ Adams (Orleans ’01), Mark Teixeira (Orleans ’99), Kyle Snyder (Chatham ’98), Billy Wagner (Brewster ’92), Chuck Knoblauch (Wareham ’88), Robin Ventura (Hyannis ‘87), Cory Snyder (Harwich ’83), Ron Darling (Cotuit ’80), Steve Balboni (Yarmouth-Dennis ’77) and Bobby Sprowl (Wareham ’76), all of whom enjoyed, or are currently enjoying, successful big league careers.